George Baldock could be out for 'six or seven week's after he suffered a hamstring sprain against Oldham on Saturday. The 23-year-old went down in the first half at Boundary Park during Dons' 2-0 win against Oldham, immediately pulling up and feeling his hamstring before being replaced. 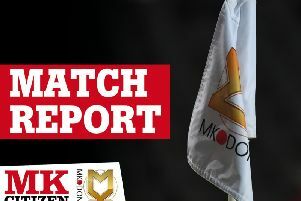 Baldock joins Scott Wootton and Chuks Aneke in Dons' injury room, leaving manager Karl Robinson light on numbers for a while. "We think it's between a grade 1 to a grade 2, so it could be up to six or seven weeks," said the manager. "We've got one of the best medical teams around, and hopefully if George has a good mentality it might speed the process up a bit. "He has been one of our best players, so it's a big blow. "With Scott Wootton, George and Chuks Aneke, it's really affecting our numbers. It'll be a tough time ahead."